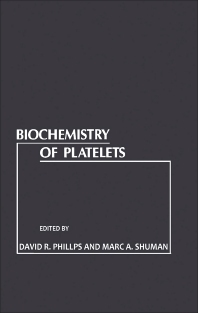 Biochemistry of Platelets is a comprehensive review of the biochemistry of platelets, with emphasis on the molecular basis for the various biological processes in which they participate. Topics range from stimulus-response coupling mechanisms to platelet contractile proteins, platelet membrane glycoproteins, and storage organelles in platelets and megakaryocytes. The expression and function of adhesive proteins on the platelet surface is also discussed. Comprised of 12 chapters, this book begins with a description of the morphological and metabolic responses to agonists, as well as the involvement of certain processes in the coupling of agonist-receptor interactions to platelet responses. The following chapter deals with platelet arachidonate metabolism and platelet-activating factor, focusing on the release of arachidonate from platelet lipid stores; pathways of platelet arachidonate metabolism and effects of arachidonate metabolites; and inhibition of platelet arachidonate metabolism by aspirin. The structure, function, and modification in disease of platelet membrane glycoproteins are then discussed, along with prothrombin activation on platelets and platelet regulation of thrombus formation. Secreted platelet proteins as markers for pathological disorders are also considered. This monograph is intended as a reference for investigators involved in platelet research as well as a source of information for those working in other areas of biological investigation.